Everyone needs a few salad recipes up their sleeve for potlucks and parties. 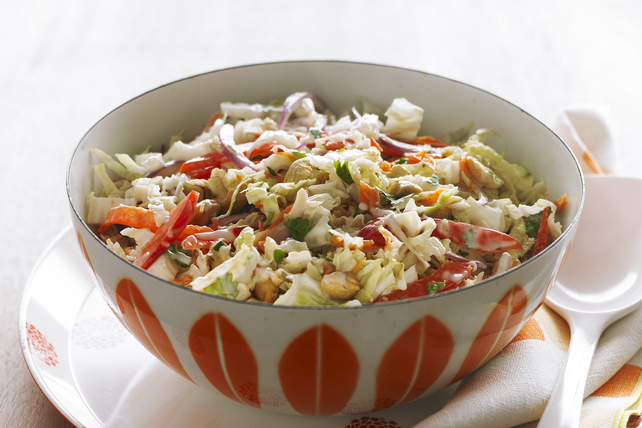 Add our Thai Slaw to your repertoire - it’s crisp, crunchy, savoury and (best of all!) this salad can be made ahead of time for effortless entertaining. Mix Miracle Whip and lime juice until blended. Add to cabbage mixture; toss to coat. Add cooked cleaned shrimp, shredded cooked chicken or pork, or tofu cubes to the slaw. Combine cabbage, vegetables and cilantro. Mix Miracle Whip and lime juice. Refrigerate both separately up to 24 hours. Add Miracle Whip mixture and nuts to cabbage mixture just before serving; mix lightly. This trendy salad is sure to be a hit with family and friends. And as a bonus, it provides an excellent source of vitamin C from the peppers and cabbage, per serving.